In 2013, I had the pleasure to see Barbara, an extremely solid German film set in the 1980s amid the split, the human trafficking, and the overall drama of that time period in that place. The movie is an emotional depiction of the struggles of that era, telling the story of one woman who could be any woman, one man who could be any man. It boasts a cast and crew made up of Petzold, Hoss, & Zehrfeld, the same trio who now bring us Phoenix. We are, once again, in Germany, after WWII, and at a place where the events of that terrible war are still effecting the land, the people, and the quality of life of a nation. But while Barbara was a quiet tale full of undercurrents & mood, Phoenix takes a step in the director of passion, relaying much of the same emotion & depth, but with a touch more drama. This added fire makes this movie just that much better, and should cement it as one of the best foreign films of the year. Nelly is a Holocaust survivor, though horribly disfigured from her ordeal. Thought dead, she emerges from the camps only to find the world changed, her home destroyed, her singing career ended, and the husband who once loved her gone. With the help of her friend Lene, Nelly gets back on her feet, also undergoing reconstructive surgery on a face torn by war. Almost unrecognizable now, Nelly begins to feel unreal, lost in the gaps between her old life and the new existence she must somehow forge. She sees her husband Johnny at a local club, the man who left her to be taken by the Nazis, and he doesn't recognize his wife. What he sees is a lost woman who looks like the girl he used to love, who could pass as her in a pinch, and might be able to claim the inheritance that she is now owed. Nelly, confused and afraid, goes along with the plot, pretends to be herself, anything as long as she can be near Johnny, the man who left, the man she'll always love. What an incredibly heavy & powerful story, set in a time that breathes melodrama. And yet, Phoenix holds itself back from becoming an over-the-top tale of woe, while still playing with a soap opera feel of mistaken identity, secret love, and horrible betrayal. 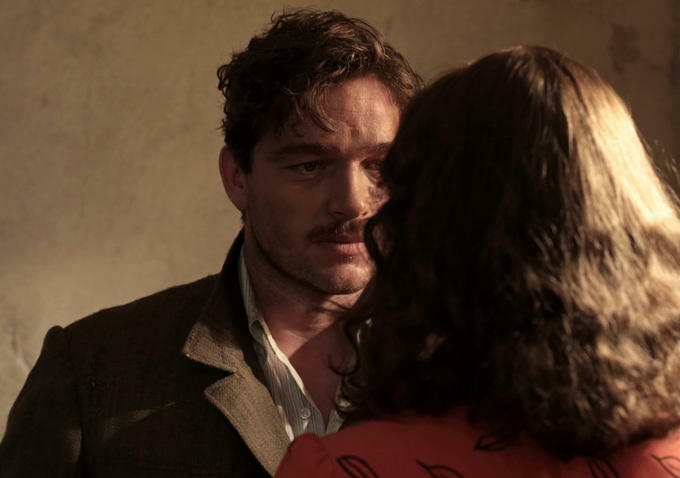 Petzold weaves this story amongst the fabric of war-torn Germany, creates a stunning sense of reality, but is able to make the fiction entertaining in a conventional way. He combines realism and dramatics so seamlessly that we become lost in a world that's part history and part his complete creation. With soft touches, short delays, and restrained feeling, we become witnesses to a plot that plays out as lava travels down a mountainside; relentlessly, inexorably, and without remorse. Phoenix is a relatively short film at around 90 minutes, keeps the focus centered on one idea, seems so simple on the surface, and yet is full of beautiful metaphors that will stun you as they are revealed. It's a film worth the wringer it puts you through, a chance to feel a story deeper than you might wish. Credit Hoss & Zehrfeld for supporting such a cumbersome emotional load almost completely on their own. The only other real character in the movie is Lene, Nelly's friend, played by Nina Kunzendorf to perfection. There are added elements there that you could sift through after viewing the film; Lene's love for Nelly, what she represents, why she makes the choices she does. And somehow that added piece never detracts from the main pair and their story, which is the only thing that matters in the end. And speaking of the end, you will not see a more compact & cathartic ending this year, or any other year for that matter. Hoss & Zehrfeld compliment each other so well, work off one another so smoothly, that the ending becomes this incredibly believable moment that will stick in your mind for days after. Phoenix, as a whole, is a film that gets it right, in almost every area, failing only to produce magic rather than reality, which won't actually be a negative to those looking for such strong cinema.